On Lenox Avenue, just south of 125th Street and a few steps from James VanDerZee’s old darkroom in which he caught the dazzling glamour of a Black Manhattan at twilight, stood, and perhaps still stands in ruined form, the Lenox Lounge, a storied uptown nightspot famous for its zebra upholstery and players only – priced drinks, its checkered mosaics and its checkered history. The club was already something of a living museum when I first came to know it. Vaulted and low‐lit, the Lenox was a vivid palimpsest of Afro‐America. One half expected Duke Ellington’s insomniac eyes to fix on you from across the bar as you listened to Ja Rule and Ashanti duet. Brothers rocked their logo‐splashed Avirex and Fubu carapaces with impeccable custom suede Wallabees or unlaced Timbs. Gorgeous, ageless women decked in furs, hooped earrings, and plunging tops laughed with sly glee at the players always running their game. Ossie Davis bar‐side baritones, distinguished and downhome, traded Melvin Van Peebles‐like tales you could scarcely believe, yet were all true. Matter of fact, I’m damn near certain I saw Melvin storying there one night myself. But to tell you the truth, it’s been years, and a night at the Lenox Lounge never lent itself to clear recollection. The opening last summer of a 40,000-square-foot Whole Foods directly across from the old Lenox Lounge felt like a chess move: white queen to black king. The new emporium, which comes with an Olive Garden, is the crown jewel of the redevelopment of the 125th Street corridor — a 2008 City Council rezoning plan that paved the way for what has been described as the “mallization” of Harlem’s main street, Martin Luther King Jr. Boulevard. The street now boasts a Red Lobster, an Old Navy, and a Raymour & Flanigan outlet. But the M&G Soul Food Diner that had survived since 1968 is gone. Only its “vintage” sign still hangs over what is now a fashion boutique. Revisiting this legacy in the new millennium, Sharifa Rhodes-Pitts’s stunning 2011 book Harlem Is Nowhere captured the decline of a legendary neighborhood that continues to radiate cultural energy through its archives, its scrapbooks, its folk heroes, and its block association battles. There’s a deep melancholy to her story of coming to know a place only to watch its residents pushed evermore to the edge; of attempting to find belonging in a neighborhood where a proud past looms over a community that is losing the battle to determine its own future. For a long time, it was a melancholy I shared. Harlem seemed like an anchor of the imagination — impossible to let go. True it was never entirely (or originally) black. But its special character for over a century was the unique result of middle‐ and upper‐class blacks, proud and fed up with racist redlining, banding together to buy real estate uptown. That action paved the way for countless others, generations who have called it home, and in the best and worst of times kept alive its spirit. For black artists and writers it has been nothing less than a literary mecca, a Paris with better music, warmer voices, and hot sauce. But what if, in this generation, the hope we continued to place in that one neighborhood, like the hope that in 2008 we had placed in one man, was misallocated? What if, at this very moment, the seeds are being planted for another kind of revolution, for a global mecca whose birth pangs you might miss if your vision was focused too narrowly on the blocks north of Central Park? Right after the neo‐Nazi marches in Charlottesville last summer, I found myself on an A train heading uptown. Next to me, an old man pored over the images of chaos and hatred in the Daily News. Nearby, in a typical scene of contemporary courtship, a teenage couple shared earbuds, watching a music video on her iPhone. Both of them sang along with the chorus, stopping only to flirt with each other in Dominican Spanish and English. They were listening to one of the summer’s breakout hits, a song called “Unforgettable” by the Moroccan‐born, Bronx‐raised singer French Montana, featuring American rapper Swae Lee. In the video, the duo dance with kids from a local troupe in the shanty towns of Kampala, Uganda. For Montana, the location reflects a subtle choice (in an otherwise decidedly apolitical career) to showcase the African diaspora in his music, reminding his audience of his own identity. The video for his 2016 single “Lockjaw” does something similar. Featured rapper Kodak Black’s Haitian origins are evoked in scenes of street life in Port‐au‐Prince juxtaposed against images of the Haitian community in Broward County, Florida. In a sense, this is obvious. Stars like Beyoncé, Jay‐Z, and Kanye West are global icons, tastemakers, and ambassadors for American blackness. But the American R&B that they represent has been creolized. The influence of the Barbadian singer Rihanna, for instance, has been decisive in mainstreaming the rhythms of the Caribbean in pop music. Justin Bieber is just one of a slew of white pop stars who have turned to dancehall in order to make hit records. The sonic contours of the Black Atlantic have become louder, more insistent than ever before. One of the most striking examples of this has been the return of Afrobeats, mixing the Atlanta‐based style of contemporary U.S. rap and R&B with primarily Ghanaian and Nigerian pop music, producing a hybrid sound that is poised to dramatically reshape the landscape of popular music in the coming years. It builds upon an already dense transatlantic feedback loop: the collage of Mississippi and Niger Delta blues made famous by the Malian musician Ali Farka Touré, the interpretation of funk and soul for the Lagos dancefloor by Fela Kuti, and the pioneering jazz of voyagers like Randy Weston and the South African singer Sathima Bea Benjamin who, as Robin D.G. Kelley traces in Africa Speaks, America Answers (2012), captured the spirit of African nationhood and resistence to apartheid. Now a new wave of artists is poised to reiterate that call, carrying forward a vision of diaspora that is, on one hand, enabled by social media, smartphones, and streaming downloads, and on the other, threatened by a resurgent ethno‐nationalism that is hostile to everything it stands for. Did Paul Gilroy see all of this coming? His 1993 book The Black Atlantic argued for a major rethinking of black cultural geography and its relation to the modern world. Pushing back against the tendency of scholars of his generation to assert essentialist and often reductive nationalist claims about black identity, Gilroy theorized a new world mediated by the Atlantic littorals — one brought into being by the Triangular Slave Trade that tied Africa, South America, the Caribbean, North America, and the British Isles together. Black culture, he argued, is inherently heterogeneous and transnational and best understood through the concept of diaspora — a historical analogy borrowed from Jewish history — whose use he helped popularize in relation to people of African descent. Gilroy was concerned primarily with the circulation of ideas, in particular the movement of utopian, dissident, and activist thought. The Black Atlantic correspondingly focuses on black intellectuals whose work traversed the continents, like Martin Delany, W.E.B. Du Bois, and Richard Wright. It also explores the occasions and paradoxes of cultural belonging in black music: the introduction of African‐American spirituals to Europe by the Fisk University Jubilee Singers in the 1870s; Jimi Hendrix’s “gypsy” aesthetic against the backdrop of the Swinging London of the 1960s; and the importance of Marvin Gaye and Detroit’s Motown sound to Nelson Mandela and the ANC political prisoners on Robben Island. The music of the black diaspora is a polyrhythmic matrix that includes rhythm ‘n’ blues, merengue, jazz, reggae, funk, disco, rhumba, soul, hip‐hop, samba, reggaeton, baile funk, and dancehall. But from the vantage point of the early nineties, just before the explosion of global interconnection fostered by the internet, the consumption and exchange of this music — the ability of musicians to circulate their work instantaneously or to collaborate with major artists in other countries — was still limited. Today it’s never been easier, and the Black Atlantic is thriving. Consider the literature of Chimamanda Ngozi Adichie, Teju Cole, Zadie Smith, Edwidge Danticat, Jamaica Kincaid, and Junot Díaz; or the lesser‐known explosion of francophone writing from the Haitian‐Canadian novelist Dany Laferrière, the Guadeloupian writer and scholar Maryse Condé, or the Djiboutian satirist Abdourahman Waberi. The surge of interest in transnational narratives ranges across the arts. Ryan Coogler’s recently released superhero film Black Panther has occasioned a popular outburst of Afrocentric pride unseen in Harlem since Marcus Garvey’s UNIA parades came down the block a century ago. Unsurprisingly, the diasporic communion in music is an even broader and more striking phenomenon; it is the live signal of this grand cultural transformation, the shockwave of Black Atlantic cultures reconnecting in our time. What will the music of this new phase of the Black Atlantic sound like? One answer comes in the form of Nigerian superstar Wizkid. Citing Fela Kuti and Bob Marley as key inspirations, as well as the hip‐hop of Snoop Dogg and Master P, Wizkid (Ayodeji Ibrahim Balogun) hails from Lagos, grew up in an interfaith household reflective of the national religious split (his mother is Christian and his father is Muslim), and quickly stood out for his ability to fuse the older Fela Afrobeat sound with contemporary rap, R&B, and reggae. His crossover into the American market began after Drake was introduced to his music by the UK grime artist Skepta. (This is itself an example of how London — with its overlapping generations of migrants from Africa and the Caribbean, as well as the abiding influence of black America — is a creative hub for the diaspora.) Wizkid’s mainstream appeal seems nothing less than assured — he’s rumored to appear on Beyoncé’s next album; he has recorded with Chris Brown and Drake; he’ll perform at Coachella in April; he started his own label, Starboy Entertainment; and he’s been an important patron of Nigeria’s booming fashion industry. The new generation of Afrobeats is colored by the distinctive warble of Auto‐Tune crooning, itself a legacy of the talk‐box Zapp & Roger introduced into R&B in the 1980s before Daft Punk (in a classic Elvis move) repopularized it and made it a key signature of the hip‐hop and R&B of the early noughts. In Wizkid’s music, this vocal style is married to distinctive rhythmic patterns inspired by percussion from across West Africa and the Sahel. The digitized vocals as well as a combination of Moog synth lines fill in the slick arrangements favored by contemporary producers. Atmospheric chords and relaxed tempos, closer to lovers’ rock than to disco, replace the jazzy horn and guitar licks of the Ghana “highlife” sound and the train‐chugging funk riffs that characterized the classic Nigerian Afrobeat of the seventies. You can hear all of this come together on Wizkid’s 2014 breakout hit, “Ojuelegba,” a track that celebrates the eponymous neighborhood in Lagos where he got his start in music, where the people, as he sings, “know my story.” Alternating between English and Yoruba, his lyrics like “My people suffer, they pray for blessings / for better living” evince the themes of every classic rap record: a celebration of hustling and striving to achieve success that would get one out of the hood, while simultaneously showing profound attachment to one’s rough‐and‐tumble origins. Ojuelegba is literally a crossroads in the city of Lagos, but it is also a metaphorically rich and suggestive site from which to think about the roots and potential reach of this music. The landing spot for most migrants coming to the city from across the African continent, its name joins together Eshu and Elegba, two of the most important spiritual figures in the Yoruban religion of Orisha. These complementary figures often appear as one, the god of trickery, with one foot in the spiritual world and one in the material (causing him to limp or move in a syncopated manner, to dance). Somewhat like Hermes, he is tasked with relaying messages, especially to people who find themselves at a crossroads. “Ojuelegba” traces Wizkid’s trajectory from the studio where he got his start to his career as global pop star, and it speaks to a new generation of Africans who see in his journey their own aspirations. Africa is at a crossroads, and young people want to connect across borders, to enjoy a freedom that has for them long been undercut by conflict, neocolonial exploitation, and rampant corruption. The sense of pride is palpable, the message clear: it’s a new day. The appeal of this music tracks real change on the ground. Where at one time there might have been room for only one pop star to represent the African and American continents (a role an artist like Akon played in the mid‐2000s), there is now a thriving music scene with viable internal markets for streaming and touring. One important result is the emergence of black women as pop stars in their own right, like Tiwa Savage, sometimes touted as Nigeria’s Rihanna, or the phenomenally talented Yemi Alade, a cross between Missy Elliott and Janelle Monáe with her own unique Afropop sensibility. There is also hope for bridging the sometimes hostile divides between neighboring countries. One of the leading superstars of Afrobeats, Mr Eazi, born in Nigeria but schooled in Kumasi, Ghana, embodies this outreach (his breakout 2017 mixtape is entitled Life is Eazi Vol. 1: Accra to Lagos). African‐American artists like the Wisconsin‐born Jidenna are seizing on the moment as well, reaching across the Atlantic to catch the Afrobeats wave and boomerang it back. The new accessibility of platforms for production and distribution (including drones for making high‐quality music videos) means that musicians have more power both to share their music and to control their artistic vision. The image of modern Africa that Yemi Alade portrays in her videos is not entirely dissimilar from the Wakanda imagined in the alternative future of Marvel’s fantasy; the afro‐modernity of Wizkid’s sets update the vibrant, modish aesthetic of Malick Sidibé’s 1960s studio portraits, giving them a similar retro‐futurism. His sold‐out stadium concerts in Sierra Leone, Rwanda, Cameroon, and South Africa, each carefully documented and shared on social media, demolish the perception of these countries as hopelessly backward “shitholes” from which people can only want to escape — instead refashioning them as places we might be lucky to reach. Du Bois said that the twentieth century would be defined by “the problem of the color‐line.” He foresaw the decline of empires in the West as an opportunity to rebalance power across the globe. Today Lothrop Stoddard’s old fear of “a rising tide of color” continues to hold sway, and the color line has resurfaced as the imperial fever dream of impregnable border security, drone sentinels, a Great Wall to keep out the dark hordes. The President of the United States’ derogatory remarks on Haiti and the lump‐category of Africa (which also appears to include all of the Americas south of the Rio Grande), are typical in this respect. They illustrate the imaginary cordon sanitaire peddled by reactionaries who want to contain an emergent Black Atlantic identity bloc that their antagonism will likely only help to consolidate. One of the ironies of the present is that, even as we continue to reel from this renewed ethno‐nationalist sentiment in the United States and Europe, and neoliberal capitalism continues to hollow out our metropoles, the reach of black cultural capital is growing, reaching heights that would have dazzled even the most accomplished fellow travelers of the Harlem Renaissance. Yet when Paul Gilroy revisited the question of the Black Atlantic in 2006, he sounded a distinctly pessimistic note. While observing that, “much of what now passes for U.S. culture worldwide, is in fact African American in either character or derivation,” Gilroy feared black expressive culture was losing its ability to resist cooptation. The pressures of neoliberalism upon the production of black music, he argued, were chaining it ever more tightly to the logic of material consumption, de‐skilling its artistry and craft, and encouraging the glamorization of sexism, among other worrying trends. Looking around, he felt “an acute sense of being bereft of responsible troubadours,” figures like Jimi Hendrix and Bob Marley who wove a note of rebellion and an ethical or spiritual message into their music. Such debates about the political role of black music are vital and can continue without replacing protest, organizing, and voting. It would be delusional to imagine that resistance or even opposition can be martialed simply by enjoying a style of music, even if that music were produced by “responsible troubadours.” But we also know that culture can feed political mobilization. The Popular Front of the 1930s, as cultural historian Michael Denning has shown, was also the time of the Cultural Front. The Freedom Songs accompanied the Freedom Riders. Public Enemy has done more to popularize the spirit of Black Power among the hip‐hop generation than what remains of the Black Panther Party. As Plato once warned, “when modes of music change, those of the State always change with them.” Fela Kuti saw this insight as an opportunity. He saw a role for black music in nudging world historical change in the direction of decolonization, not just of the African continent, but of the minds of everyday people everywhere. In declaring that “music is the weapon of the future,” he meant not only that the creative seduction of music is preferable to the coercive destruction of guns, but that a new era was coming, one that would be characterized by fluid cultural exchange, where music would dissolve the old borders of blood, soil, and nation. We are not going to win the battle over the gentrification of Harlem. The black mecca of the new millenium, if there is to be one, might well prove to be that city Du Bois rhapsodized in The Souls of Black Folk, “the City of a Hundred Hills, peering out from the shadow of the past into the promise of the future.” That city was Atlanta, where he hoped the flourishing of black universities and centers of learning would break the spell of crass American materialism and bring a renaissance to the South, a mighty cause that urgently needs and deserves our vigorous support today. We will remember, and must remember, Harlem; but we will also have to begin to look forward and redraw our horizons. The days when James Baldwin might head uptown to Wilt Chamberlain’s nightspot, Smalls Paradise, to celebrate the appearance of a new novel, when the party went to the break of dawn at Baby Grand’s over by the bridge, when Charlie Parker jammed at Minton’s, and Billie Holiday, her gardenia perfuming the air, as Frank O’Hara remembered it, “whispered a song along the keyboard / to Mal Waldron and everyone and I stopped breathing,” the glamorous age of Harlem when black folk decided to make it a showcase for the world — those days are not coming back. But there’s also a lot more French being spoken on 116th Street, and it’s not by tourists from Paris but families from Dakar and Bamako and Yaoundé. The story of Harlem and its dream of a black internationalism is only turning a new chapter. 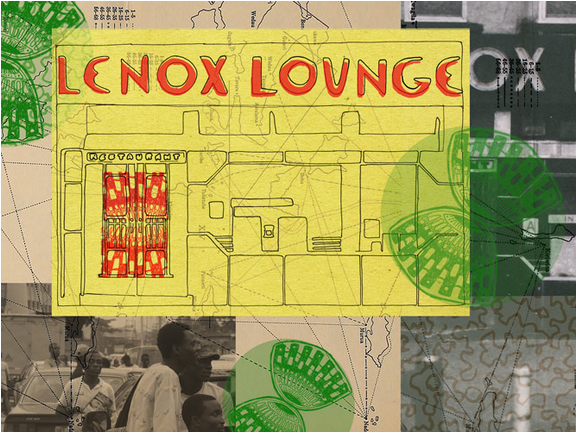 The Lenox Lounge may be gone, but “the gift of black folk,” as Du Bois put it, has never been more potent. From Lagos to London, from Havana to East Atlanta, from the Gulf of Aden to the Gulf of Mexico: Harlem is everywhere.